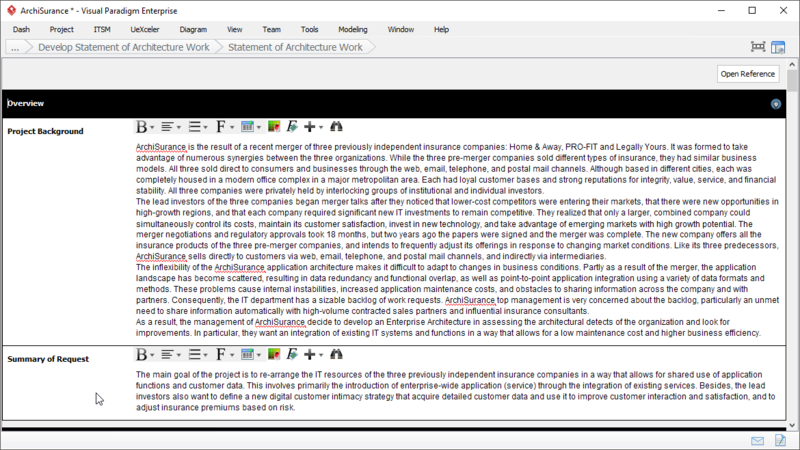 Statement of Architecture Work is one of the TOGAF deliverables you can create with the TOGAF tool. The document defines the scope and approach that will be used to complete an architecture project. It is the document against which successful execution of the architecture project will be measured and may form the basis for a contractual agreement between the supplier and consumer of architecture services. You are about to finish the Technology Architecture phase. Before you start the next phase, review the Statement of Architecture Work and make necessary updates. Open the form of the Statement of Architecture Work and review its content. Information are pre-populated from both the changes made throughout this phase and from the same document developed in previous phase. Make necessary updates. If you are happy with the content, you can complete this step right away.